The Gilded R5 has a golden hue on its exposed metallic frame that runs around the sides of the handset. There are a few gold highlights, including the hardware keys below the display, the ring around the camera module and the Oppo logo on the back. Despite its almost unreal thickness, the Oppo Gilded R5 feels rigid in the hand thanks to the metal frame. On the base R5 the back panel is a slab of naked metal, which enhanced the feeling that you’re holding a sliver of metal. The Gilded R5 moves away from the silvery aluminum to a white-painted back, which makes the Gold pop more. Because of the paint, the back feels a bit different though. The retail box is almost identical, though it too has a new color scheme to match the gilded phone. The box was already one of the more premium retail packages around. The box and its cover are made of rigid plastic rather than cardboard and is roomy, going against the recent trend of more and more compact boxes. Inside are the usual accessories. The VOOC charger puts out a massive 5 amps at 5V, which will charge the 2,000mAh battery from nil to 75% in half an hour. The headphones come with an extension cable – because the Oppo R5 is so thin, there’s no 3.5mm audio jack, instead the extension cable has a microUSB plug on one end and a 3.5mm audio jack on the other. There’s a one-button remote on the headset. Under a cardboard sheet (which holds the pin ejector tool) are a bunch of manuals and a plastic case with a frosted glass effect. The case is transparent on the sides so it won’t cover the golden flanks of the Oppo Gilded R5. The original Oppo R5 had a flip case instead. Anyway, below all that in the retail box is a microUSB cable for charging and data. It’s a sufficiently-stuffed retail box (with a premium design for the box itself), but it could have used some customization. For example, the headset is still the white/silver combo from the base R5 instead of switching to gold. There was no special gold theme for the customized Android or extra apps that we could find. Anyway, you can find extensive details on the Oppo R5 from our full-length review, the same things are true for the Gilded R5 (aside from the new paintjob). 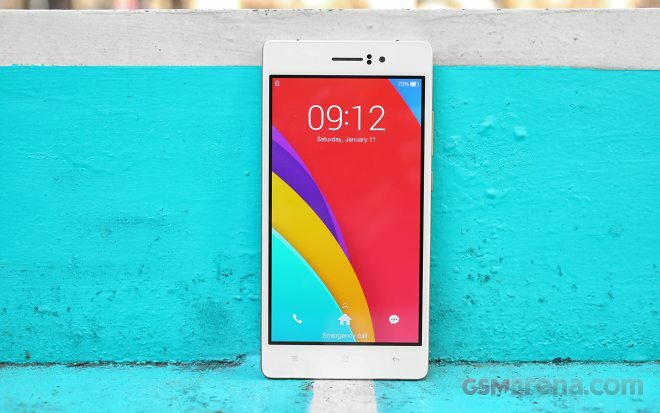 The short story is a super thin smartphone with metal frame, a 5.2″ AMOLED screen with 1080p resolution, a Snapdragon 615 chipset (octa-core Cortex-A53, Adreno 405) and Android 4.4 KitKat with Color OS 2.0 on top. The phone has a 13MP camera that can shoot RAW and 50MP with software interpolation and 1080p video at 30fps, going up to 120fps at 720p. The selfie camera takes 5MP snaps with its 83° lens. Oppo is promising 2160p video and 1080p @ 60fps from the main camera with a future update. Once that happens the 16GB of built-in storage will feel rather cramped (there’s no microSD slot). 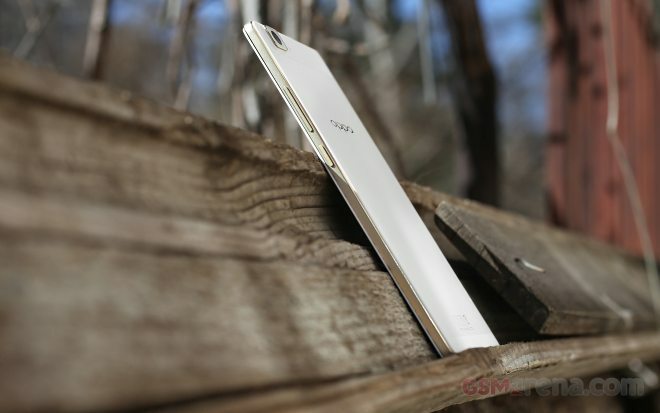 Here’s our video hands-on of the limited edition gilded Oppo R5.